rsts11 note: This is the second of a two-part series featuring mobile internet routers. The first part is posted over on rsts11travel.com, as it is a bit milder technology. The second part appears on #rsts11 since it’s a bit more POHO than random travel, and will be cross-promoted on the travel side. rsts11 note: This is the first of a two-part series started on #rsts11travel, featuring mobile internet routers. The second part will appear here on #rsts11 since it’s a bit more POHO than random travel, and will be cross-promoted on the travel side. Check out the travel section – #rsts11travel has more coming this week! You’re tuned to rsts11, the tech blog from Robert Novak (Est. 2011). If you’d like to turn to the new travel section, visit rsts11travel.com and see what we’re writing about over there. Coming in the next week or two will be a two-part mobile power piece as well as a slightly more detailed hotel review from your host’s birthday escape. Unfortunately, no pina coladas, but fortunately, no getting caught in the rain either. rsts11 will continue to roll out tech content,including some hardware reviews and homelab / POHO build travelogues, a bit of big data, and some more economy power-networking options. I have a bad habit of buying lots of accessories for an electronic device I’ll have for a year or so, and then they pile up because people don’t want to buy them with the old device. This is usually the case with mobile phones and laptops, but it also comes up with tablets. I have three keyboard cases and at least three regular cases for my iPad 3rd gen, including a Hello Kitty keyboard. During a particularly nifty Target promo around their Cartwheel app, I got a 15% discount off any electronic device over a two day period. This included iPads, and since my 16GB 3rd gen iPad was full, I got a 64GB Air at nearly 20% off (with redcard discount). Then I went about looking for a case. An article someone pointed me toward said the Case Crown Omni was the best on the market. I bought it to use while I searched for a keyboard case that would work. I don’t have a lot to say about it except that it was indeed a good case, better than any I found at local retail in a few days of looking. Among the recommendations that came in was one from Kieran Hannon, the CMO of Belkin (who also own the Linksys brand, in case you’ve been under a WRT54G for the past year). 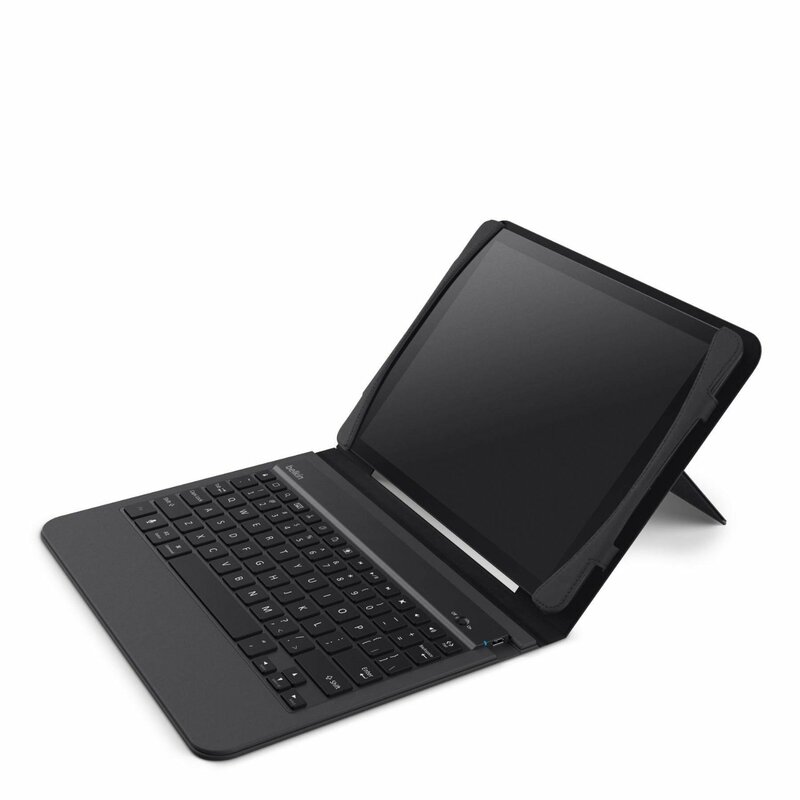 Top rated case is @Belkin #Qode http://t.co/gCCyNCmtEF RT @gallifreyan: Who's got a recommendation for case/keyboard for iPad Air? He unsurprisingly recommended his firm’s “Qode” (pronounced as “Code”) line of keyboard cases, with the top-of-the-range Qode Ultimate Keyboard Case being well rated (albeit a bit pricey at $130). There’s also a Slim Style model (msrp $80) with a kickstand on the iPad holder, and a Thin Type model (msrp $100) that works as a stand when in use and clips over the iPad when not in use. As an aside, the Belkin product I use the most (up until now, at least) is their swivel power adapter with USB and AC outlets. The SurgePlus model is the current one, with 2.1A charging on USB. I suspect the 3-4 of them I have are old enough to be the 1A versions (time to upgrade!). Great for travel, especially if you’re at an event where they think one power outlet per table is generous. I bought a Slim Style at Target, marked down from $80 to $71 and further discounted 5% via redcard (I think this was after the Cartwheel deal). I used it for a day or so before mentioning on Twitter that it was nice, but the kickstand design wasn’t very lap friendly. This is what you could call the Surface Dilemma, after Microsoft’s almost-there laptop-replacement tablet which hasn’t yet wowed everyone with its lap-friendliness. My assessment of the Slim Style was that, on a desktop (or probably even on a roomier airline tray table), it would be good. The keyboard and its layout felt reasonable, and I felt it protected the iPad well enough that I could just drop it into my laptop bag without fear. But I returned it, because of the lapability factor, and mentioned this on Twitter. Taking the @belkin Slim Style keyboard case back… will probably try the full-on Qode next. The @belkincares account asked if they could help, and were very courteous even though they (luckily) couldn’t make my lap resemble a tabletop more. I’ve had a few good exchanges with @belkincares over the past year or so, from stacking cable inquiries around their older KVMs to some arcane questions about the wireless bridge line. About a week later, Belkin had generously provided a Qode Ultimate Keyboard Case for me to try out at no cost. I plugged it in to charge and then started using it the next morning. The Qode Ultimate has a more contained layout, in that rather than a kickstand, the iPad shell magnetically “sticks” to the keyboard shell. It has three positions, as with the Slim Style, but they’re within the footprint of the keyboard, and thus much more convenient on the lap or on a tray table. The keyboard shell is sort of a dark blue “aircraft-grade aluminum alloy” that I didn’t recognize as blue at first. It does pick up fingerprints and the occasional light scratch, but I only notice that when getting the iPad out or putting it away, since this part is on the bottom when in use, and also hidden when you’re using it in “reading mode” (i.e. folded back). The iPad shell piece is black plastic with a leatherish inset that incorporates the kickstand “hinge.” The Belkin logo is on the “front” (i.e. bottom of the keyboard) and the Belkin name is on the leatherish hinge section and on the front of the keyboard. The keyboard turns itself off unless the iPad is “connected” to one of the three kickstand positions. So if you flip it back so that the keyboard is behind the screen, it’s automatically powered off. Same with closing it up; the keyboard is off and the battery life is extended. For some reason, Belkin have swapped two of the keys on their keyboards. I believe the Slim Style and Thin Style place the colon/semicolon key between “L” and “Enter” whereas the Ultimate places the quote key there. In each case the other key is to the right of the space bar. Kensington to the semicolon’s rescue? I’m slowly getting used to the keyboard layout. It’s very typeable except when I need a semicolon or a colon. However, I decided that if I was going to write a review, it would be good to make sure that I liked the Belkin keyboard case for reasons other than it being given to me at no cost. So I picked up a Kensington KeyFolio Exact case, which I found on clearance at Marshall’s for $40. It includes a Google Drive offer (which is apparently processed manually by Kensington, as I haven’t received the code for the offer in the past week), so it was an inexpensive experiment. The KeyFolio is bulkier, with a detachable bluetooth keyboard, a stylus holder in the hinge, a wider range of color options, and a lower price if you’re going to buy it at retail. I found that the keyboard itself was brilliant, managing to fit both the semicolon and the quote key between “L” and Enter by making the keys a little bit smaller. And since the Kensington had a fixed “kickstand” mounting point in the case closer to the hinge, they had room to put separate number and function key rows on the keyboard. The Belkin Slim Style also does this, since it has most of the surface area to spend on keyboard real estate. And I actually found myself using the function keys on the Kensington, which I hadn’t done on the Belkin. I used the Kensington for just short of a week, and while I loved the keyboard and almost got used to the stand layout, I found I had to go back to the Belkin Qode Ultimate. Why? I preferred the Qode Ultimate’s ease of turning off the keyboard, the lightness and grace of the entire case, and its turning off the iPad screen and locking it when I closed the case. I expect I will hold onto the Kensington in case someone I know needs a super-cheap case for their Air and doesn’t need lapability. I am tempted to try the Thin Style just to see how that style of keyboard feels as a case. But the iPad is back in my Qode Ultimate Keyboard Case, just in time to head off for a company sales meeting out of town next week. And maybe I’ll have to write with fewer semicolons. 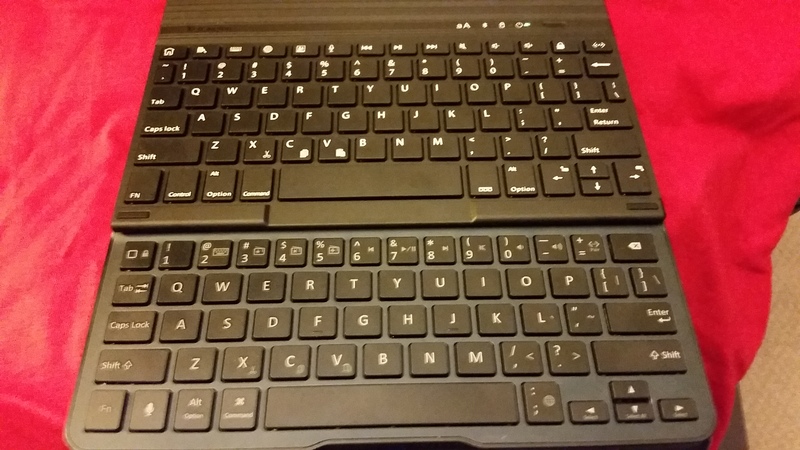 All keyboards tested charge with standard micro-USB cables (included), and paired very easily with the iPad Air via Bluetooth. Battery times are based on the manufacturer’s website or packaging (YMMV of course). Prices found on 8/22/2014 online. Belkin Qode Slim Style keyboard case – $34 at Belkin or Amazon. Good design, great keyboard, excellent value for the cost, but suboptimal for lap work. Great keyboard, kickstand design could use some work, doesn’t seem to lock the screen when closed. Belkin Qode Ultimate keyboard case – $129 at Belkin, around $90 at Amazon. Slim and sturdy case, very lap-friendly, no dedicated function key row, semicolon key is on the bottom row. The Qode Ultimate turns your iPad into a laptop, although it comes at a premium (which I feel is worth it). The Qode Slim Style and Kensington KeyFolio are good keyboards for tabletop use, and come in at a lower price. Disclosure: Thanks to Kieran Hannon and Belkin for providing the Belkin Qode Ultimate Keyboard Case at no charge to me. Other than a twitter inquiry of “and the verdict?” they did not require or request a review, blog post, or any other consideration.